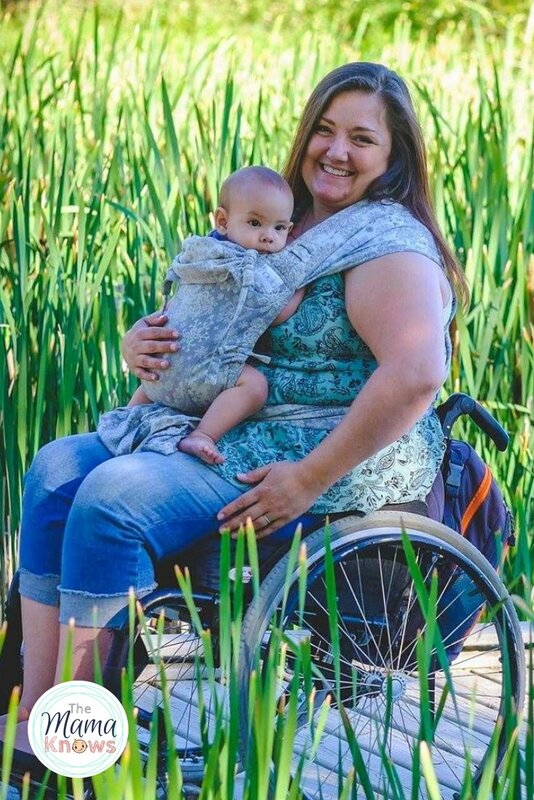 The miracle of One Size Cloth Diapers is an Adjustable Rise! This feature is how one diaper can succeed at fitting a baby from around 8lbs to Potty Training. 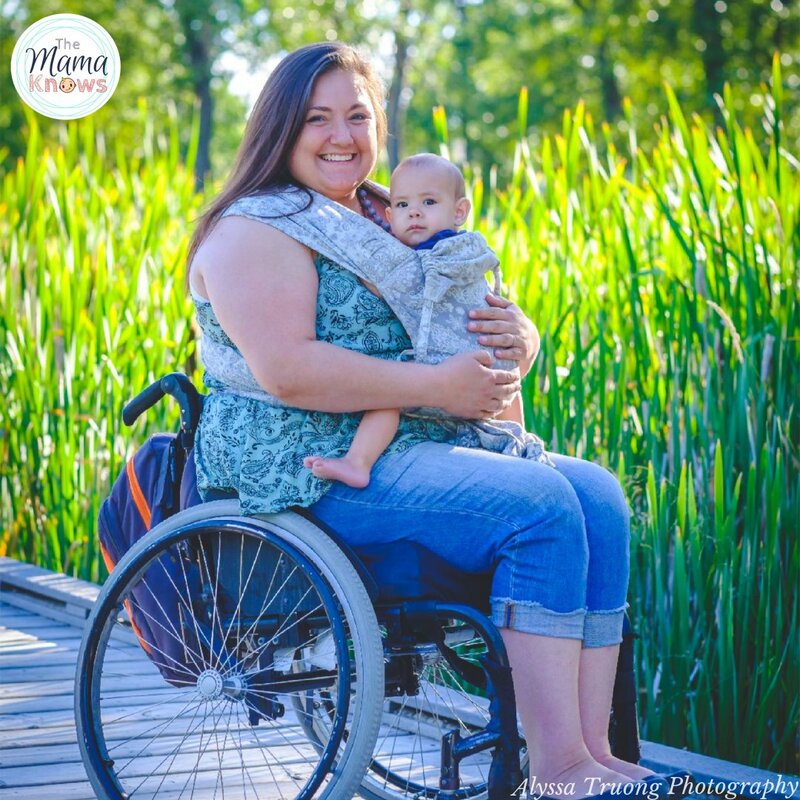 Unless you buy specifically sized diapers (small, medium and large), your diapers will likely have an adjustable rise. 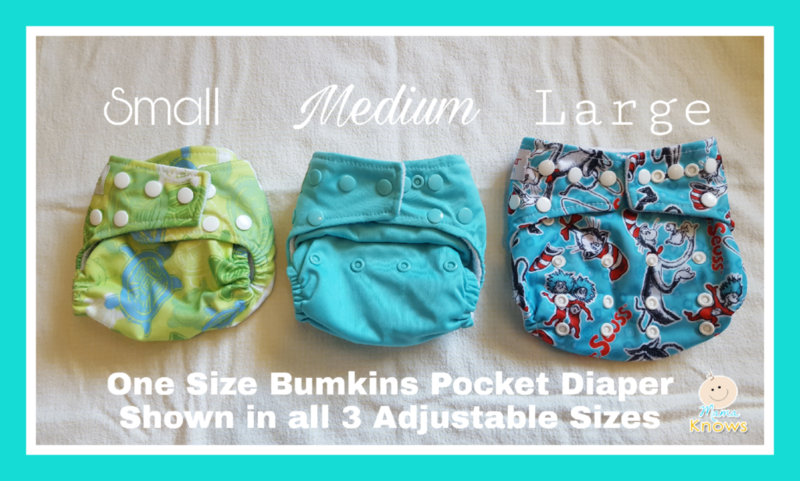 Some sized diapers do have minor rise adjustments as well (such as Thirsties Duo Size 1 and 2) but “One Size” diapers will have the most dramatic adjustment. The most common method to adjust a diapers rise is with snaps on the front of the body. There will be 2 columns of snaps, or even 3 or 4, and each column will have 2 or 3 rows of snaps to achieve small, medium and sometimes large sizes in addition to leaving all snaps open for full size. Why 3 columns instead of 2 or vice versa? The column in the middle (aka Centre Rise) helps keep the diaper from bulging outwards. 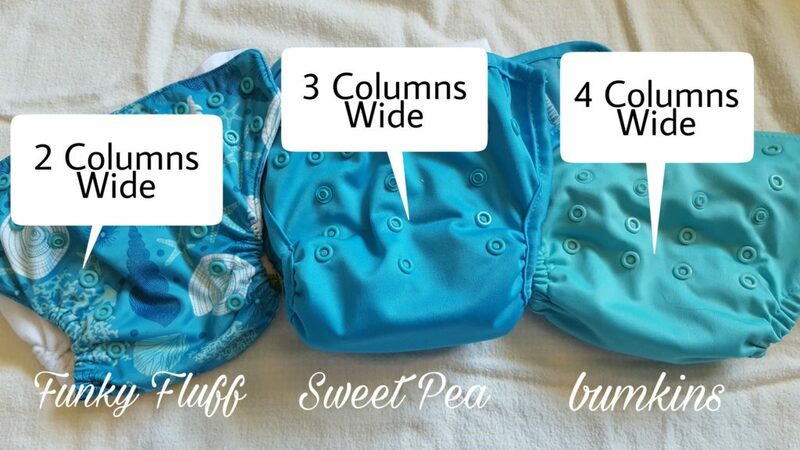 The downside is that small babies are narrow, so some One Size diapers choose 2 columns (ie. Funky Fluff) for more baby weight ranges. This basically becomes personal preference, as both styles work. If it’s a cover though, and your lining and absorbency is not as stable, you might prefer 3 columns such as Flip brand covers. Some brands such as Soft Bums and Fuzzibuns use no snaps at all to achieve one-size adjustment. They accomplish this with hidden access to the leg elastics! You can tighten the leg elastics and bunch the material of the diaper into a very custom fit. They typically use Toggles or Hole and Button functions. 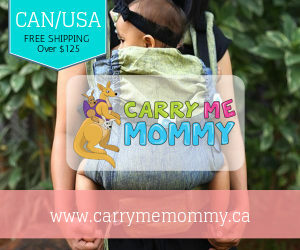 Think of it as tightening a drawstring with a toggle, or adjusting an inner waistband of your kids pants with buttons that fit into slits on an elastic. Advantages? No snaps sticking out, and more size customization than snaps. Disadvantages? Not as easy to adjust quickly if diapering two or more children of different sizes. How often do I Adjust the cloth diaper rise? You’ll want to pay attention to the coverage you are getting. You dont wanr to see a bum crack at the back, nor do you want too much exposed under the belly button. Lengthening the rise too much will cause leg gaps. 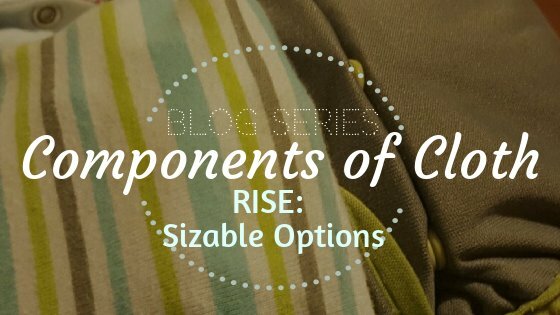 The ideal rise setting will have the top of the leg elastic fitting in the top crease of your babies inner thigh. Just like the line from underwear. As a general rule of thumb I check my rise when my baby moves up a clothing size, or if I’m getting leaks. 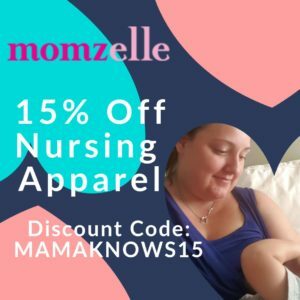 Don’t panic when your under-10 month old ends up on maximum setting for a bit. As soon as they start walking they tend to go down a rise as their chub slims out. It’s rare for a baby to outgrow a one size diaper before potty training (around the 2 year mark), but not impossible. Some brands make larger diapers if you run into this problem. Just look for a higher than 35lb weight max, as 35 is generally the standard. I’ve never used any diapers with only a leg elastic adjustment. It’s good to know which brands use that feature. Personally, I prefer 3 levels of rise snaps going both directions. 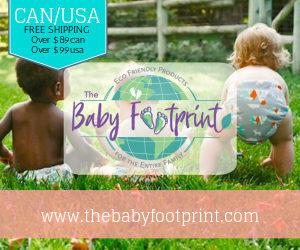 I love these articles, they are very informative and would be great for anyone not comfortable with modern cloth diapers. I’m glad you’ve found them helpful! The second two articles are on the docket for next week! Thank you so much for your continued support of my little blog.